Corrosion mapping can be used to map the variations within a material into a helpful colour coded map. The process can be performed with various techniques – typically utilising ultrasonics for thickness measurement information, in addition to our proprietary Low Frequency Electromagnetic Technique (LFET) technology which uses variations within magnetic fields to detect changes in the material. Our ultrasonic based corrosion mapping tool provides high resolution corrosion detection for a variety of applications. The technology can be applied to flat plate, pipelines, pressure vessels, storage tanks, columns and tubes >= 4 Inch diameter. Our Low Frequency Electromagnetic Technique (LFET) can be used in situations where surface condition is not appropriate for ultrasonics, where linings or coatings are present for example, or where large volume of scanning is required quickly. 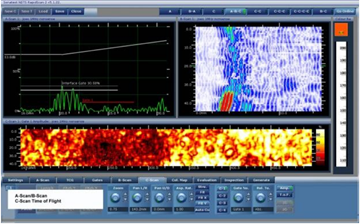 LFET based corrosion mapping is typically used as a fast screening tool, allowing 100% coverage where ultrasonics would only inspect a small percentage in the same time frame. We then go back with ultrasonics to prove up any areas of interest.